Sarah Avery gave her services to the “Red Cross Working Party” Regt. No. 1688 in Tettenhall Wood Nr. Wolverhampton. She served from February 1916 until February 1919, sewing garments at home in her spare time (so no hours are recorded on her Red Cross card). Her address was 64 Mount Road, Tettenhall Wood, and she was awarded Badge No 57415 and a certificate. Without knowing her maiden name, tracking down further details of Sarah has been more tricky. In 1911, she appears with her husband, James Avery, and daughter, Helen Holt, at 61 Mount Road, Tettenhall Wood. Given the years they have been married, there is a likely marriage between James Avery and Sarah Ann Steenson in Wolverhampton in 1895. However, I have not been able to confirm details of her birth – she is apparently 46 in 1911 and born in Worcester, but there is no record of anyone with that name. It is possible that she was originally Sarah Anne Westwood, who married James Steenson in Dover in 1884. James Steenson later died in Wolverhampton in 1894, so it appears as though she then remarried. I have not been able to confirm details of her death, either, as there are a number of possibilities. Edgar Page was born in Wolverhampton on 31 December 1884, the son of Samuel Wells and Matilda Aston Page. Samuel Wells was the Official Receiver of Wolverhampton. In 1901 he was at school in Repton in Derbyshire. He became a well-known field hockey player, including representing England and winning a gold medal with the Great Britain team at the 1908 London Olympics. His mother Matilda died on 16 November 1910. By 1911 he was a chartered accountant and living with his father at Penn House, Wolverhampton, along with his siblings Raymond Charles, Constance Muriel and Harold Aston, and servants Frances Hammond, Eliza Rogers, Beatrice Wells and Lily Hickey. Along with his brothers, he served in the army during the First World War. He became a Lieutenant in the South Staffordshire Regiment, serving in France from 20 October 1915. He survived the war, but does not appear to have married. He died on 12 May 1956 at Connaught Nursing Home, Wolverhampton. According to the National Probate Calendar, his address was Gorsty Hayes, Tettenhall, and the value of his effects was £9044 19s. The Express & Star on 4 June 1915 showed this photograph of Private George Neale, of the 2nd Battalion of the South Staffordshire Regiment, who had been killed in action. 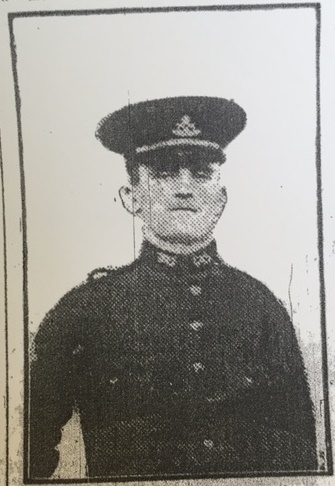 The article included the information that he had worked on the Great Western Railway, lived at 17 Cleveland Road, Wolverhampton, and had served for seven years in the Army. The Commonwealth War Graves Commission confirms he died on 27 October 1914, and his regiment number was 8008. He is commemorated at the Ypres (Menin Gate) Memorial. His medal index card includes his disembarkation date as 12 August 1914, and the Army Register of Soldiers’ Effects lists his next of kin as his mother Sarah, and brothers William and Alfred. He appeared with his family at Wallville Road, Handsworth, in the 1891 census, and at 91 Raby Street, Wolverhampton in 1901. By this date his mother had remarried and was now a Mullaney. If anybody has any additional information, we would love to hear it! James was born in Bilston in 1888, christened Alfred John, the son of Frederick George and Mary Ann Organ. By 1911 he was living with his parents and brother Fred at 201 Oxford Street, Bilston, and he operated the slotting machine for a hollowware manufacturer (presumably Joseph Sankeys and Sons). He served as a Private with the South Staffordshire Regiment (service number 2623) in France, first entering the war on 5 March 1915. He was awarded both the British War Medal and the Victory Medal. He died of wounds on 15 October 1915. His next of kin and sole legatee according to the Army Register of Soldier’s Effects was his sister, Sarah Williams, but his cemetery records list his brother, Mr F. G. Organ, as his next of kin (now living at 55 Shand Street, Wishaw). He is buried at Lillers Communal Cemetery in France, and is commemorated on the Sankeys War Memorials at St Leonard’s Church, Bilston. When looking through research I had references in three different locations to a Wolverhampton man, J. Ward. When I decided to pull them all together, I discovered they were three different men. Joseph Ward served in the Balkans as a Private with the 1st Battalion of the South Staffordshire Regiment (service number 15313), first entering the Theatre of War on 21 July 1915. He was awarded the Military Medal, as listed in J. C. J. Elson’s Honours & Awards: The South Staffordshire Regiment 1914 – 1918, and his name was recorded in the London Gazette on 17 December 1917. Because of his fairly common name, and without any idea of his age, there are various possible births for him. He is not listed on the Commonwealth War Graves Commission site, so he appears to have survived the War. The Express & Star on 12 January 1917 listed a Sergeant J. Ward of the Worcestershire Regiment (service number 10147) as amongst the wounded. This is John Joseph Ward, who was born about 1885, and served with the C Company, 5th Battalion of the Worcestershire Regiment. According to the Army Register of Soldiers’ Effects, he died of influenza in Camberwell. His next of kin were given as brother James A., sisters Annie and Florence, and sister-in-law Rose. However, I have not been able to confirm his details on the censuses. Finally, there is Jeremiah Ward, listed in the first volume of Andrew Thornton’s South Staffords at War: August 1914 – December 1915. He was born in Wolverhampton in 1885, the son of Jeremiah and Ann Ward. In 1891, they were living at 95 Dudley Road, together with a further five children: Lillie, Eliza, Priscilla, Hezekiah and Stephen. By 1901 they are at Cobden Street, and the remaining children at home, Jeremiah, Hezekiah and Stephen, are joined by Charlotte, as well as their cousins Margaret and Stephen A. Bennett. Jeremiah had become a pit winder at a local colliery. He married Mary Ann E. Ellitts in Wolverhampton in 1907, and had a son, Jeremiah, in 1909. By 1911 they had moved to Shirebrook, in Nottinghamshire, and were joined in the household by Jeremiah’s brother Hezekiah, his wife Louisa and daughter Eva. Jeremiah was a miner hewer. Jeremiah joined the 2nd Battalion of the South Staffordshire Regiment (number 7133), disembarking on 12 August 1914. He was wounded in fighting on 23 October 1914, and he died of his wounds a day later. The Army Register of Soldiers’ Effects has his widow, Mary Ann, as his next of kin, and his trade is given as Engine Cleaner. He is buried at the Cement House Cemetery, in Belgium. If anybody has any further information on any of these three men, please do share it! At Wolverhampton Archives we recently purchased Andrew Thornton’s excellent books, South Staffords at War: August 1914 – December 1915 (volumes 1 and 2), which obviously feature many local men. Some of them have already been featured in this blog, but there are many more. One of these is Frank William Brentnall. He was the son of William T. and Catherine/Katherine A. Brentnall, and was born in Wolverhampton in 1887. On the 1891 census he appears with his parents and a boarder, William Perry, at 2 Temple Street, Wolverhampton. By 1901 they were living at 21 Green Lane. Frank enlisted at Lichfield as a Private with the 1st Battalion of the South Staffordshire Regiment (service number 7044), and by 1911 he was serving in Gibraltar. He later transferred to the 2nd Battalion, disembarking for France on 12 August 1914. During his service he was awarded both the British War Medal and the Victory Medal. On 20 February 1915, Frank was killed in action at Givenchy, in France. One of his friends, Private G. Merrick, wrote an account to his brother Charles of how he was killed, which was quoted in the Express & Star on 4 March 1915. Dear brother…I am very sorry to let you know that our old chum, Private Brentnall, was killed on the 20th February. When they had made a charge they came back to their own trenches. Brentnall went back to fetch a wounded comrade. He had got to his own trench and was just getting in as the Germans shot him. He was a very brave man, and we are all very sorry that he could not get in safely again. I shall see that he has a good cross on his grave…Tell them that he was one of the bravest soldiers that England ever enlisted. If he has gone we are all proud of his name. Tell his relatives in Wolverhampton that he died a hero. He is buried at the Guards Cemetery, Windy Corner, Cuinchy, in France. An article in the Express & Star on 3 December 1914 details the death of the 21-year-old Arthur Wainwright, of the 3rd Dragoon Guards, on 6 November 1914. His address was given as Granville Street, and he had served in the Army for three years, first in Egypt before going to France. In fact christened George Arthur Wainwright, he was born on 26 May 1893, and baptised on 23 July the same year at St Andrew’s, Wolverhampton. His parents were Arthur and Susannah Maria Wainwright (nee Street). In 1901, he was living at 58 Derry Street with his parents and sister Charlotte. His father died in 1903, so by 1911 he was living with his grandparents, William and Charlotte Street, at 28 Granville Street. His mother and brother, Charley David, were at the same address. By this date, Arthur had become a bottler at an ale and stout brewery. Arthur enlisted on 10 October 1911 in the 3rd Dragoon Guards (Prince of Wales’ Own) (service number 6359). He first fought in France on 31 October 1914, but was killed in action not long after. He is commemorated on the Ypres (Menin Gate) Memorial in Belgium. Sydney was born in Wolverhampton in 1894, the son of Archibald and Emma McNicol. He was baptised on 25 Jul 1897 at St Mark’s Church, Wolverhampton. By 1901, the family were living in Shettleston, Lanarkshire, along with Sydney’s siblings Helen, Archibald, John and Marion. In 1917, Sydney enlisted with the 10th Battalion of the Argyll & Sutherland Highlanders (number 22588). His trade was given as machineman. He served in France, but was wounded, and died on 27 March 1918. He is buried at Haringhe (Bandaghem) Military Cemetery in Belgium. John Maddocks was born in Wolverhampton on 2 August 1888, the son of John and Kate Maddocks. By 1901 had moved to Walsall and were living at 396 Pleck Road. John was living with his parents and sisters Florence, Sarah and Kate. On 20 November 1905, John enlisted in Birmingham in the Worcestershire Regiment (number 9645). Here his trade was listed as “butcher”. John became a Lance Corporal in the 3rd Battalion of the Worcestershire Regiment. He was killed in action on 13 January 1915 at Kemmel in Belgium. He is buried at the Kemmel Chateau Military Cemetery. Benjamin Jackson was born in Wolverhampton in 1891, the son of George and Ellen Jackson. In 1901, they were living at 10 Granville Street, together with Benjamin’s brothers George, Walter, Harry and Frank, and sisters Ellen, Minnie, Olive and Violet. Benjamin’s mother, Ellen, died in 1910. By 1911, they were at 67 Coventry Street, Willenhall Road, and only Benjamin, Harry, Frank, Olive and Violet were living with their widowed father. Benjamin had become a setter in an edge tool works. Benjamin enlisted as a Private in the 7th Battalion of the South Staffordshire Regiment (number 9930). At some point, Benjamin married an Edith Ada (maiden name unknown), and they had a child, David, as both of these are given as next of kin in the Army Registers of Soldiers’ Effects. There is a record of a marriage between Benjamin Jackson and Edith Ada Granger in the 3rd quarter of 1909 in Dudley, Staffordshire. However, Benjamin is listed as single and living with his father in 1911. Their son, David, was born in the fourth quarter of 1911, also in Dudley. His mother’s name is spelled ‘Grainger’ in this record. Benjamin Jackson died of wounds received on 8 November 1916, but he was posthumously Mentioned in Despatches on 15 May 1917, as reported in the London Gazette on 22 May 1917. He is buried at the Contay British Cemetery in France.